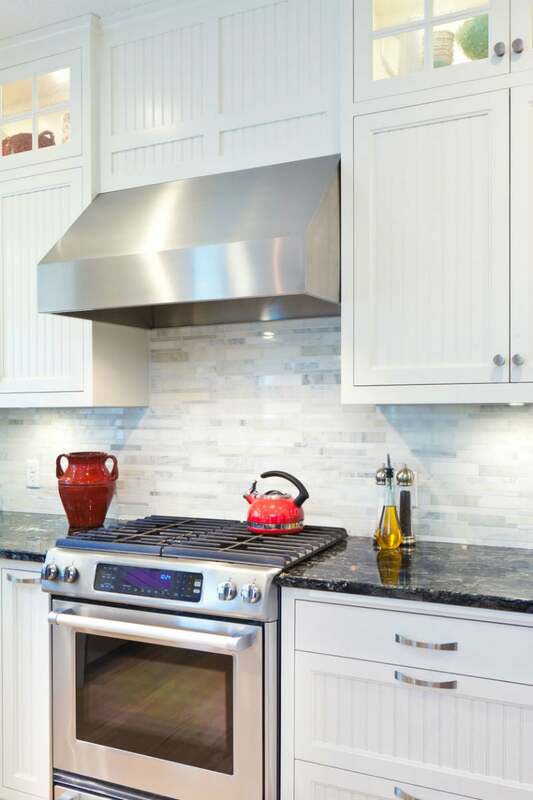 Banish grease and grime from kitchen cabinet surfaces with the right materials and techniques. You probably spend the majority of your kitchen cleaning time focusing on the big three—sink, counters, and floors—but your cabinets require regular attention too, especially the doors. That’s where tiny droplets of cooking grease, food splatters, and steam tend to settle, and then attract and hold dust, leading to dingy, dull, or streaked surfaces. 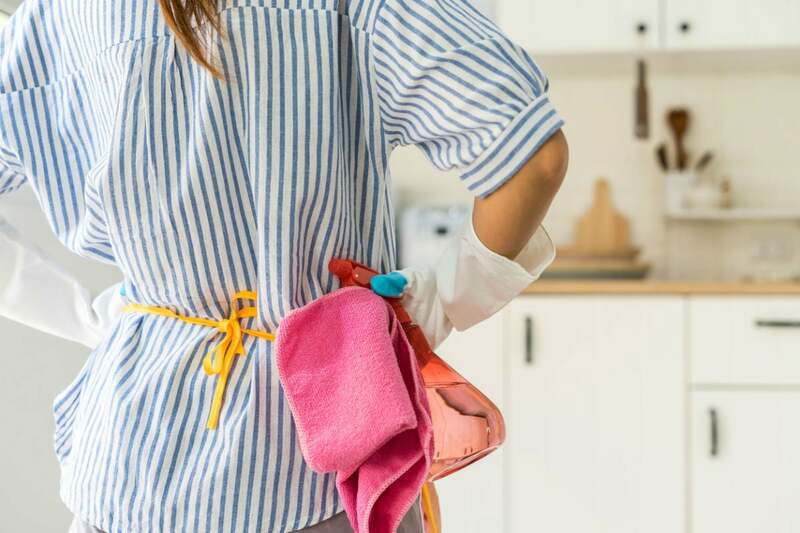 Luckily, while a bit tedious, cleaning kitchen cabinets isn’t difficult, nor does it call for smelly or potentially toxic chemicals. Whether your cabinets are painted or finished wood, they’ll perk right up with a few common household items and a bit of elbow grease. Just take care not to damage their finish with an overzealous approach. Here’s how to do the job right. DO use a gentle cleaning solution. Leave the abrasive cleaners and scrub brushes to your sink; harsh scrubbing can damage kitchen cabinets’ finish or paint. Instead, prepare your own gentle cleaner by mixing one part mild dishwashing soap with two parts hot water, or the same ratio of distilled white vinegar to hot water. (The heated water helps soften grunge and grease so you’ll be able to wipe it away more easily.) Pour your cleaning mixture into a spray bottle, and you’re ready to go. Spray the cleaning mixture onto a microfiber cloth or soft rag until it’s damp but not drenched. Too much moisture can damage your cabinets’ paint or finish. Now, wipe each cabinet door from top to bottom, paying extra attention to any trim or molding where dust and grime tend to accumulate. Don’t forget to wipe handles and knobs, and the insides of the cabinet doors, as well. Spritz more cleaning solution onto your cloth as needed, but never let the cloth get wet enough to drip. Squeeze excess into the sink if necessary. DO tackle tight spots with an old toothbrush. Some cabinets have ornate trim or deep grooves that a rag just can’t access. In these cases, dip an old toothbrush into your cleaning solution, and use the toothbrush to gently scrub those hard-to-reach spots. 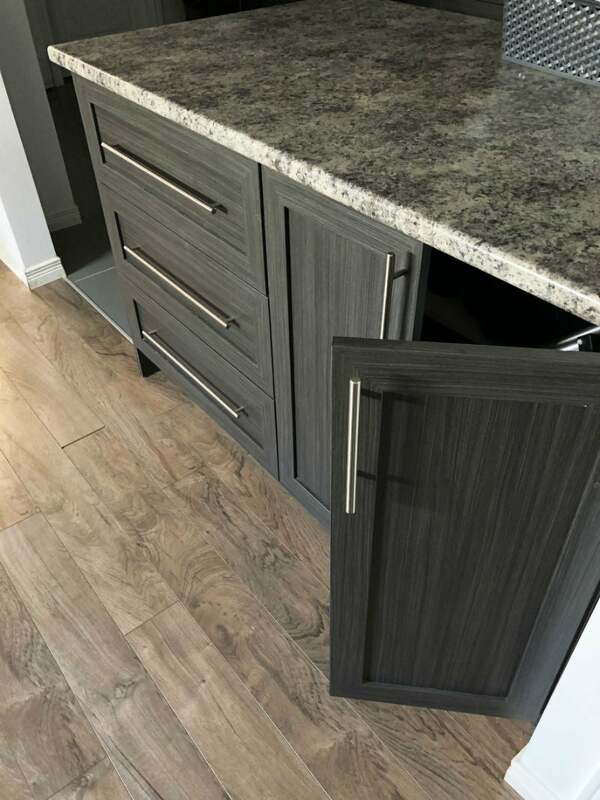 Don’t forget the areas around the cabinet handles or knobs, and the edges of the cabinet doors, which can be tricky to reach with a rag. DON’T let water run into the hinges. Although your cleaning solution is safe for finished or painted wood, as well as laminate, it’s not intended for your cabinets’ hinges. You don’t want your time spent cleaning kitchen cabinets to leave you with rusted hardware. Instead, use a dry microfiber cloth to wipe away dust and grime from the metal. If there’s a particularly greasy or grungy spot, spray just a drop or two of cleaning solution onto your cloth, scrub the dirty spot, and then wipe the metal dry. DO remove the cleaner with a final rinse. Once you’ve cleaned your cabinets, go over them once more with a clean cloth lightly dampened with warm water. This removes any lingering cleaning solution or grime. As with your cleaner, it’s best to work from top to bottom to avoid leaving any drips behind. DO dry the cabinets after cleaning. Letting cabinets air dry after cleaning can damage or bubble the finish or paint. Instead, use a soft cloth to dry all damp surfaces and encourage a shine. If your cabinets have glass insets, spray a clean cloth with your vinegar mixture or a commercial glass cleaner and wipe the glass thoroughly on both sides. It’s generally fairly easy to remove dried food splatters, grease, and other kitchen grunge from glass, but you might need to tackle the spot twice to completely eliminate it. Don’t use anything abrasive on the glass, and wipe the panels dry once you’ve finished cleaning them. DO tackle tough spots with baking soda. 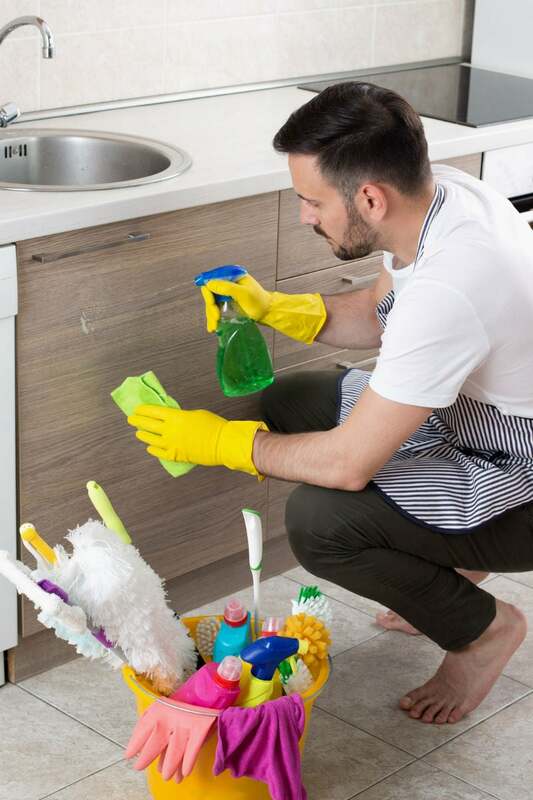 If stains, dried grunge, or grease remain on your cabinets even after you’ve finished cleaning kitchen cabinets, you’ll need to add an extra step. In a small bowl, mix one part baking soda with two parts water. Use a clean, dry cloth to dab the paste onto the dirty spots. Let the paste sit for a few minutes, and then wipe it away with a damp cloth, gently rubbing until the grunge is gone. Re-wipe the spot with a water-dampened cloth, and then dry with your microfiber cloth or soft rag. DON’T skip periodic deep cleaning. At least twice per year, go further than cleaning kitchen cabinets’ surfaces. Empty your cabinets entirely, and then wipe down the shelves, inside of drawers, and cabinet interiors along with the outer surfaces of the cabinets, using the same cleaning supplies and procedures as outlined above. Before returning items to the cabinets, consider whether they are worth keeping. Toss or donate anything you no longer need or use, and get rid of heavily chipped dishes, cracked mugs, plastic storage containers with missing lids, and the other useless odds and ends that tend to accumulate in the deepest recesses of kitchen cabinets.